White sausage gravy is something I grew up eating over homemade buttermilk biscuits. I have a grandmother (my "Granny") from Kentucky and she made some mean biscuits! And, she is the one from whom I learned to make sausage gravy. 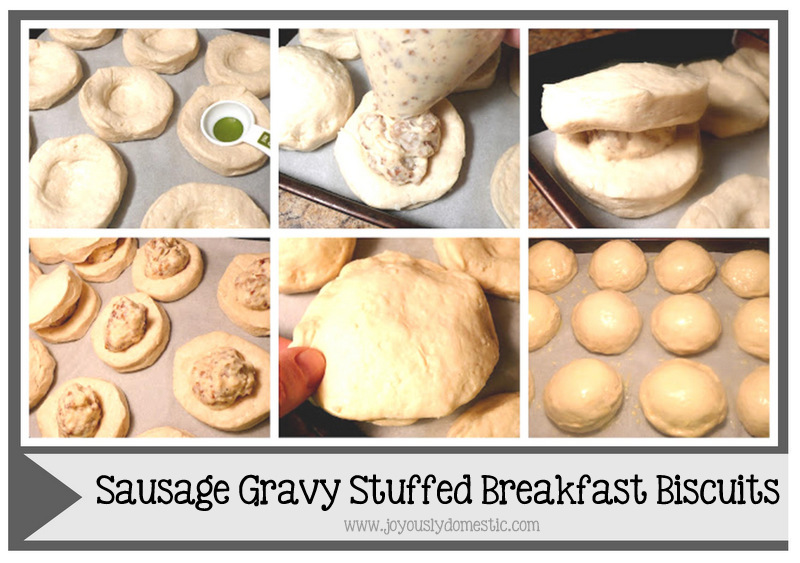 I recently posted a recipe for Stuffed Breakfast Rolls, which got me thinking about a biscuit filled with sausage gravy that my mother-in-law used to order from a food delivery company (Schwan's) years ago. I loved them! Unfortunately, the company stopped making and selling them. I have thought of them often over the years and decided to see how hard it would be to replicate that same idea. The main key here is to make your gravy just a bit thicker than you would for regular sausage gravy over biscuits. Then, you will be chilling the gravy in a gallon-size plastic bag in the freezer before filling the biscuits. I must admit that although I have attempted to duplicate my grandmother's buttermilk biscuits over the years, they have never quite been a success for me. (Remember ... I am baking-challenged to some degree!) Therefore, I used Grand's canned buttermilk biscuits for this recipe. This recipe will yield 12 stuffed biscuits, but uses 24 biscuits to make. We had some of these leftover, so I wrapped them individually in foil and parked them in the fridge. Just reheat them in the foil in a 350 degree oven for about 10 - 12 minutes. Heat a large skillet (cast iron, if available) over medium-high heat. Add sausage and break apart with a spoon as it cooks. I like mine to get a little crispy. Cook thoroughly ... about 8 - 10 minutes. Leave the rendered fat drippings and the sausage in the skillet. Sprinkle in the flour and whisk for about 1 minute. Pour in the milk and continue to whisk until it all comes to a slight boil. If it seems too incredibly thick, add in a bit more milk while whisking. Lower the heat to low and allow to simmer for a few minutes. The gravy will thicken up a lot during this time. Turn off the heat. Allow to cool in the pan for about 20 minutes. Stir a couple of times during cooling. Once mostly cooled, pour gravy into a gallon-size plastic bag. Let all of the air out and seal. Place in freezer for about 30 - 60 minutes to firm up and almost freeze. (Mine took about 45 minutes.) It needs to be very thick and cold. While gravy is firming up in the freezer, line a large baking sheet with parchment paper or spray with non-stick cooking spray. Set aside. Whisk 1 egg with a splash of water in a small bowl. Set aside. Line 12 of the biscuits up on the baking sheet. Using a tablespoon measuring spoon, press into the center of each of the 12 biscuits ... you're creating a "well." Once the gravy is fully chilled, remove from freezer. Press all of the gravy to one corner of the bag, then snip off a large opening on one corner with scissors. Squeeze a mound of gravy onto the center well of each biscuit, then top with another biscuit. Seal the biscuit dough up around the outside edges to fully trap in the gravy "mound." Do this by pinching the seams together tightly. Then, press the seal down a bit to even out the edges by "cupping" your hands around the biscuit. Do this by holding the biscuit in your hand and shaping as you would a meatball (just not quite as round). Keep working it until the seams appear well-sealed. After you've made all of your biscuits, brush each one with the egg wash.
Do not allow biscuits to touch on the baking sheet. Bake immediately at 350 degrees for about 15 - 17 minutes (on top rack in oven) or until biscuits are golden brown and no longer "doughy." NOTE: You may not use all of the gravy. I had about a half of a cup left. Also, a couple of my biscuits did split a bit at the seams, but none of the filling leaked out. Just be sure to seal as tightly as possible before baking. These look so amazing! I always love your recipes... even linked you on my blog for food inspiration!! My mom made these for many years using home made biscuit dough and I've made them using Grande for several years now. We like to add diced cooked bacon to the gravy sometimes. One note, yoyo don't have to use two biscuits, you can split one and make smaller servings. It works great using Grande flakey style biscuits. Thanks for the tips and the bacon idea, Josh!